After 15 years of misdiagnoses, Daphne Faitla-Rodriguez's mother Meleke died of stage 4 lung cancer. Her tragedy inspired an international movement seeking standards for better treatment. Daphne Faitla-Rodriguez and her wife are sitting on an orange kayak in front of Australia’s famed Sydney Opera House, all smiles. Daphne is holding a white t-shirt with teal and black lettering. The shirt reads: Team Meleke, Lung Force, John 4:16. This simple shirt has become part of Daphne’s mission – a mission to use her voice because others can’t. She speaks locally and nationally about what she believes is the lack of education and awareness, even among doctors, when it comes to lung cancer. For Daphne, it’s personal. Daphne Faitla-Rodriguez and the rest of her family. When her mother Meleke was finally diagnosed with lung cancer, the 15 years of being misdiagnosed with allergies, sinus infections, or even arthritis were finally over, but it was too late – the cancer had metastasized throughout her entire body. It was stage four and it was everywhere; cancer had taken over her sternum, liver, spine, thighs, stomach, and back, and it was creeping into her bones. The only place it hadn’t spread was to Meleke’s brain. Daphe was heartbroken by the fatal diagnosis, and she began to educate herself about lung cancer, questioning why she knew so little. The more she read, the more shocked was by what she learned. While she pondered how it was that lung cancer awareness was so lacking, yet information on other cancers flood the news and personal conversations, she had an “aha” moment. Looking back, what’s frustrating to Daphne is not just the lack of public education and awareness, but the number of times the medical community got it wrong. For years, doctors refused to listen to Meleke’s requests for further testing, insisting that her symptoms were related to common conditions. Meleke grew up in American Samoa, raising Daphne and her seven siblings on the small island of Aunu’u where they led an active life and ate off the land, growing most of their own produce and consuming fresh fish. Meleke was strong – she played rugby and climbed mango trees, but she always had a persistent cough even though she never smoked a cigarette. 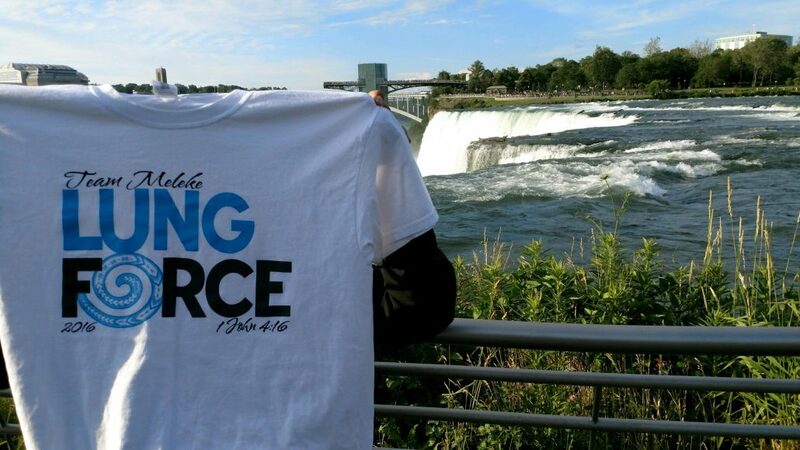 Team Meleke’s Lung Force shirts have become a global phenomenon. Here’s two people posing with one in Russia. As Meleke went to doctor after doctor and received improper diagnosis after improper diagnosis, her cough got worse and Daphne knew something was wrong. Perhaps, she thought, the doctors on the island weren’t as good as those in the states. 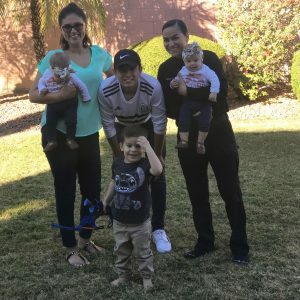 So, when Daphne left American Samoa to join the marine corps, she sent her $3,000 signing bonus to her mom so she could travel to Arizona to see a specialist. The diagnosis? Allergies. And then upon a follow-up, bronchitis. Coming from a small island, they thought that all doctors in America were “top of the line,” and they believed the diagnosis. That was 2007. In 2008, Meleke began to travel back and forth to the states to see doctors because her cough was so bad they knew something was wrong, but she was repeatedly told she had pneumonia. In 2010, she moved to Arizona to live with Daphne’s older sister. By 2014, Meleke was much worse, suffering from terrible back pain, and she returned to the doctor again. The newest diagnosis came back as arthritis. Meleke, finally fed up with diagnoses that did not seem to fit her symptoms, demanded a lung x-ray, believing she had lung cancer. Six months and multiple demands later, she received her scan and her diagnosis. Meleke chose to fight, underwent chemo and radiation, and lived for another two years, beating the odds. During that time, Daphne focused her attention on her mother, and she began to learn everything she could about lung cancer. Before she became too sick to have meaningful conversations with her children, Meleke made a request of Daphne. Now Daphne is doing just that, and she won’t stop until things change. She’s made lung cancer awareness her mission, passionately stating that everyone, including doctors and politicians, need to learn more about this often misdiagnosed and fatal disease. Shortly after her mom passed away, at the age of 56, Daphne took the first step by signing up for a lung cancer walk, and that fueled her passion. She began to look at the bigger picture, recognizing that it has to come from the top. If the government doesn’t provide the proper funding for research and education, then doctors will not be able to recognize the symptoms and order the proper tests to diagnose early. According to the American Lung Association, only 16 percent of lung cancer cases are diagnosed at an early stage, but if there was more knowledge and awareness, Daphne believes that more patients will survive. Daphne has taken her advocacy to the state and national capital. She’s shared her mom’s story with district leaders, state representatives, and the staff of her senators, John McCain and Jeff Flake. Each time she told her mom’s story she became emotional, and they cried with her. For Daphne, that was powerful – she felt she got through to them. She would then voice her concerns that lack of funding and education are killing people unnecessarily. Team Meleke at Niagra Falls. When not speaking to politicians and leaders, she’s spreading her message locally, nationally and internationally. Locally, Daphne is a leader for her security team at Palo Verde, the largest nuclear power plant in the United States. Before each shift begins, the leader will ask their group questions, and hers always focus on lung cancer. They learn important facts, such as lung cancer is the number one cancer killer, and it begins a conversation that she hopes continues in their homes and with their friends. She also serves as the emcee for the local Lung Force walk, kicking off the event and introducing the speakers. Nationally and internationally, Daphne spreads the word with her Team Meleke t-shirts. The concept was created when she and her wife were kayaking in Sydney, and it went viral. While the goal was to spread awareness about lung cancer, she had no idea just how far it would go. She originally created the shirts to build awareness and then developed the Team Meleke Challenge, encouraging people to take the “coolest picture holding up the t-shirt.” But what happened next, surprised her. She began receiving photos from around the country and world with strangers wearing her shirt in Boston, Washington, on the mountains of Hawaii, Canada and even Russia and Germany. Family, friends and strangers people post pictures of themselves in their shirt to her Instagram account, @rodsquad13, spreading the awareness that Daphne believes is so lacking about this disease. The Team Meleke Challenge has become so popular that she began receiving requests for next year’s shirt before the current year was even close to over. Daphne decided she will create a new t-shirt style every year so she can track how far and often her message is spread throughout the years. Daphne is just getting started. In less than two years, her advocacy has been seen in the halls of Congress and on the streets of Europe, plus everywhere in between. As she continues to find new ways to help spread the word and increase education, she keeps her mother’s memory alive, doing what Meleke asked and hoping to save at least one more life.